We have not done a wine review in a while mainly because we have been on the road. We stopped in at Marche Bacchus to join our friends Tex, Gidget and their sons for some blind wine tasting. Jeff Wyatt , owner of Marche Bacchus brought us over a decanter with a red wine and we gave it our best shot ! Jeff Wyatt brought to bottle out to us and explained it was a Amarone della Valpolicella La Coeta Corte Lenguin DOCG 2003 . He also added that he had just enjoyed this wine at home the previous evening. We were so intrigued by the wine we had to learn a little more about it. The Amarone della Valpolicella La Coeta Corte Lenguin DOCG 2003 is a blend of Corvinone 60% , Rondinella 30% and Cabernet Sauvignon 10% This wine is made in the Italian Veneto region using the Passito method. Grapes are dryed in a cool dry place for up to 4 months until they are semi-dry which produces the concentrated sugar and flavor. If the fermentation continues and becomes completely dry it is called Amarone which means " strongly bitter". The grapes used in this process are always of high quality. Also of note is the Corvina grape is blended with Rondinella to produce a light colored , light bodied wine that are usually characterized by tart cherry flavor and even a slight bitter almond flavor as well. Congratulations to Elaine Harris, Vegas Wine News Person of the month ! Congratulations to Elaine Harris of Vino Las Vegas for being named wine person of the month by Vegas Wine News ! The web site is moderated by Charles Moncrieff and is a great way to stay in touch with events in Las Vegas. Charles Moncrieff also travels to Europe often and has a great travel section on his web site. Stop by http://www.vegaswinenews.com and get some very good information on wine, travel, restaurants and a whole lot more. It’s almost over – but it was great! On Sept 17 we started picking the first grape: Viognier from Cuatro Vientos. And then the race began! We have now been going for about two months with no days off but the results are impressive. In general the harvest was late with low crop but very intense. A nice summer without any heat spells gave us the long hang time that works so well in Sta. Rita Hills. We started picking Pinot Noir on Sept 29 and finished Oct 19. Crop levels were at 1.6 ton/acre – well below 2005 and 2006. Good intense fruit for the winemaker but low crop for the grape grower – bottom line is that the vintage looks very promising. All is now fermented, drained, pressed and resting in barrels where the malo-lactic fermentation in going. Colors are the darkest and most intense we have seen so far and flavors are big and bold – another vintage of real Sta Rita Hills Pinot is on its way. But as soon as we were getting the Pinots to rest in the barrels it started all over: Rhone time! Syrah and Grenache is always about a month behind, so on Oct 29 we got back to the cold mornings with clippers and buckets and started again. It was a great year for the Rhones as well – best crop load with 2.3 ton/acre, which is not much for a Syrah or a Grenache but we are very happy with the outcome. As we are writing this we still have 20 fermenters going with the Rhones but we expect to have everything in barrels around Dec 1. As usual we have a had a lots of friends: “filos” (our wine club members) stopping by to help us out. Early, cold mornings, running around with buckets of grapes, punch-downs and barrel filling doesn’t seem to scare them as long as there is a good lunch and dinner with wine, stories and laughter. Thanks to all of your that joined us and shared the magic of picking grapes in a yellow/green ocean of the vineyard when the sun is rising – life is good! As we have said many times before Las Vegas has become one of the wine and gourmet dining hubs of the world. This week the Michelin Restaurant Guide awarded the prestigious one-star rating to Chef Andre Rochat's Alize at the Top of the Palms and to Andres French restaurant downtown. For Chef Andre to win a star for both of his restaurants is a great accomplishment and has received world wide recognition. to their craft and unwavering quest for culinary and service excellence; without them this would not have been possible". Additionally, I would like to express my gratitude to the Michelin Guide for their recognition and to George Maloof for allowing me the opportunity to open Alize, and bring this wonderful award to The Palms Casino Resort” Chef Rochat concluded. 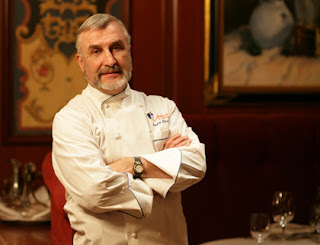 This is truly a great honor to Chef Andre Rochat who is a culinary icon in Las Vegas. Congratulations once again Chef Andre for receiving this well deserved honor. Some of the biggest names in gourmet dining came together at Chef Andre Rochat's Andres in Las Vegas to honor the late Chef Jean-Louis Palladin and raise money for his foundation. 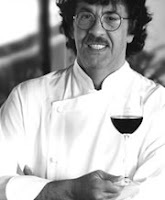 In 1974, at 28 yrs old, Jean-Louis won 2 Michelin stars for his restaurant Tables Des Cordeliers in Gascony, France. At the time he was the youngest chef to have won 2 stars. In 1979 he came to The United States to open Jean-Louis at The Watergate, in the Watergate Hotel, Washington, DC. Jean-Louis found farmers in the area to grow fresh herbs and organic vegetables, and encouraged others to raise poultry and meats to his standards. When Jean-Louis became ill, his friends, colleagues and customers sprang into action to help him. Benefit dinners were held all over America to raise money for his medical expenses. Jean-Louis passed away in November 2001. At the time of his death there was an excess of funds, these funds were used to initially fund the Jean-Louis Palladin Foundation. The Jean-Louis Palladin Foundation was incorporated in June, 2002 to serve as an ongoing tribute to the memory of chef Jean-Louis Palladin. The goal of the foundation is to create a memorial to his determination in seeking out and using the best ingredients, mentoring talent wherever he found it, and encouraging creativity among chefs. The dinner was a who's who of Chefs from all over the world. All were there to rasie money for this very important foundation. Each of the Chefs prepared a mouth watering course that was paired with a fabulous wine. The Cocktail Reception and Dinner was $325.00 per person. This magnificant dinner by these talented Chefs was followed by an Auction. All the proceeds of this event benifited the foundation. For more information please contact http://www.jlpfoundation.org/ Also a big thanks goes out to Southern Wine and Spirits for providing the wines. This was a fabulous event for a great cause and we look forward the the 7th Annual Fund Raiser next year ! to enjoy this great tradition. Chef Christophe created a nice pre-fix dinner to pair nicely with the Beaujolais. A fantastic view with friends and good food made the celebration of the 2007 Vintage one to enjoy. This is a great French tradition that is alot of fun. If you did not have the opportunity to celebrate on the actual release date, don't worry there is much to go around. Just remember these wines are not meant to age so enjoy over the holiday season ! Vino Las Vegas LLC is Born ! VINO LAS VEGAS LLC. Is born ! Thank you for all of the support from our friends, emails, and phone calls. All of our readers have interests that they want us to explore. We became Vino Las Vegas LLC so we can continue our journey in a much better way. As we said a week ago, There are big announcements coming from Vino Las Vegas. This is only the first one. We have a guest Vineyard Owner that will be a contributor to the blog from time to time. His first article about Harvest 2007 is on the way. We are very excited about what the future has for all of us. Thank you all once again ! room of Ampelos Cellars. It is open by appointment only and make some of the best wines in the area. Ampelos Winery to help out our friends Peter and Rebecca Work, owners and wine makers. we measured the temperature and sugar content to see how the fermentation was progressing. After our hard work, we had a satisfying lunch and then barrel tasted wines with Peter. We barrel tasted the upcoming vintages. Learning by doing is always a great way to become intimately acquainted with the real labor and passion that is behind a winemakers desire to make the perfect bottle of wine. We want to thank Peter and Rebecca for the privilege of following them through the various stages of making their wonderful wines. Further North in Buellton you will find One of our favorite dinner jaunts while we are in this area is the Hitching Post, a restaurant that has been popularized by the movie Sideways. The steaks are always delicious and cooked to your liking. Most of the local wines are available and the line out the door is a good indication that many feel the same way about the food and family style ambiance. Because of the overwhelming popularity of this restaurant reservations are suggested. Still along the wine trail in Santa Ynez we stopped in to the small production Beckman Vineyards . This stop was suggested to us by a few winemaker friends so we knew this was one we could not pass up. We have had Bridlewood Syrah in the past but we had never visited the Vineyard. We were passing through the very quaint town of Santa Ynez and decided to drop by the vineyard to get a real feel for what they produce. When you first dive into the vineyard you think you are at an old Spanish mission. The building is surrounded by its vineyards on all sides. Once inside we tasted the full array of what Bridlewood produces. The Bridlewood "Six Gun"Syrah 2004 is limited production and the one that we enjoyed the most. On the nose it had aromas of smoke, leather and plum. On the palate there were big tannins and spice that gave way to a long finish. This is 100% Syrah and very indicative of the Santa Ynez appellation. We usually try to stop by Los Olivos. This time we found Scott Cellars. We had met Frazer Peterson at the Santa Barabara Vintners Festival when he had just started his winery. This is one of Santa Barbara County’s newest wineries and produce small lots of handcrafted Pinot Gris, Chardonnay, Pinot Noir, Syrah and Zinfandel/Syrah blend sold exclusively from its tasting room in Los Olivos. He truly has a passion for what he does. We tasted all of his wines and enjoyed the Cuvee J the most. The Cuvee J is a blend of 78% Zinfandel and 22 % Syrah. He has a nice tasting room located on the main street in Los Olivos. It is worth a stop. For Lunch or Dinner the Los Olivos Cafe is a great option. Its November and that means the 2007 Beaujolais Nouveau is about to be released. This is a special category of 7 to 9 week old wine that by French tradition is released annually on the third Thursday of November. This year that date falls on November 15th. This new wine is sometimes called Beaujolais Primeur and is meant to be drank very young. Because it is so young and not meant to age, it is best drank within a month or two. No matter where you are most any French restaurant or wine bar should have some kind of tasting celebrating the release of Beaujolais Nouveau. We plan to be at Marche Bacchus for their celebration and a special menu. If you see us there stop by and say Bonjour! Sometimes the best trips along the wine trail are those made at the last minuet. We had planned to help out with harvest and crush a few weeks ago. However , those devastating California wildfires were burning between us and the vineyards so we were unable to go. We have the all clear so we are headed west along our wine trail to Santa Ynez and the Santa Rita Hills. We plan to help out in the winery and explore some smaller lesser known vineyards and try some great wines along the way. If you want to learn more about those appellations there are links to the right of the page. We will have lots to report on when we return. And plan on bringing back our best picks. One of our favorite restaurants in Las Vegas is Lotus of Siam. After spending many years in Thailand we knew this was the real thing the minute we walked in. It is located in a very questionable part of town but well worth the drive. Don't take my word for it. In 2000 it was named by Gourmet Magazine the "single best Thai restaurant in North America. Saipin Chutima is the owner and Chef of Lotus of Siam. She had been cooking from the age of 5 in Thailand. She has done a great job here as well. Lotus of Siam is nationally acclaimed and has too many awards to mention here. Their wine list is one of a kind. We have never seen so many Rieslings. In fact Wine Spectator awarded Lotus of Siam its award of excellence. On our latest visit we made a reservation ( a must for dinner ) and studied their vast wine list. We decided on a Reinhold Haart Piesporter Goldtropchen Kabinett 1998 Mosel-Saar-Ruwer Germany. The Haart family has the longest wine making tradition in the village of Piesport. As far back as 1382, documents show a certain Johannes Haart owning vineyard property in Piesport and with over 600 years of history behind them, the Haart's have shown a rare dedication and love for wine. During this time they've acquired outstanding vineyard property especially in the famous Goldtröpfchen vineyard. The village is located along the Mosel River in the Mosel-Saar-Ruwer region. The wines from this region of Germany are usually ripe and elegant with powerful bouquets. These wines have been known to be some of the best in the region. In the glass this wonderful wine was light to medium bodied with a light gold color. On the nose there were hints of earth and citrus fruit. The palate exploded with hints of lemon, orange and citrus acid as well as mineral attributes then a long finish with citrus acid again on the very finish. This was an incredible wine that we will surely look for again. It also was an choice to pair with the spiciness of the Thai food. The food is always incredible and our favorite dish is the Thai Beef Salad. After spending six years in Thailand, this dish and every other one we have tried, is the most authentic to the Thai regional cuisine. The best way to describe the marvelous food is to say that during our meal we often exclaim between bites, " this is amazing". If you have not been to this best kept secret of Las Vegas, you have indeed missed a truly amazing culinary adventure. Bertonini's is a regular stop for us during the week. Monday through Friday 3:30-630 they have a great happy hour. All of the appetizers are half price and wine by the bottle up to $ 49.99 is half price as well. The appetizers are so big we go there just for the happy hour and there is no need to eat dinner after that. Bertolini's is an economical place to to unwind and have some good food. The wine list is a little small compared to many other places we have dined. We can usually find a decent bottle to complement the food. The service is good and the waitstaff is personable. The last time we dinned there the General Manager Brandon Bueltel stopped by to introduce himself. Brandon told us about Bertolini's Rewards club where you earn points every time you dine. They even have several events from harvest dinners to winemaker dinners in a separate area of the restaurant. As we have always said, this blog is not only "ours" we share it with all of you. One major request that we have had from as near as Las Vegas to as far away as Taiwan is a way to contact us directly. As of today you can ! Just go to contact us to the right of the page and you can link right to our email. There is more in the works for Vino Las Vegas and as always , you will be the first to know. We will be very busy from now to years end with all kinds of events and there will be a big announcement as well ! so keep checking back . We were at Marche Bacchus and Jeff Wyatt gave our group this wine blind. After much debate we all decided it was old world and two members suggested in was a Merlot/Cabernet Blend , right bank Bourdeaux region. We were shocked that this was from the new world and even more that it was a Tempranillo from Oregon ! We were so intrigued that I had to do some research on this surprising vineyard. As we know , this varietal is widely cultivated in the northern and central parts of Spain. And is well know throughout the world. Red Lily Vineyards became a reality in 1991 , the dream of Les and Rachel Martin. The name for the vineyard came from the Bolander's Lily that grows in the nearby mountains. Red Lily Vineyards produces hand crafted wines in very limited production. This was a very nice Tempranillo and a surprise. We wish Les and Rachel the best and are anxious to see what Red Lily has next ! We have always enjoyed Australian wines. Molleydooker is no exception. When we heard that Bob from Vin Sauvage was going to be at Marche Bacchus and letting us enjoy some great wines from Mollydooker we had to stop by for some wine and lunch on the terrace. All of these wines have been rated as high as 97 points !! The first one we really enjoyed was The Mollydooker " Gigglepot" Cabernet Sauvignon 2006. It was awarded 95 points by Robert Parker's The Wine Advocate. This is a powerful Cabernet with hints of concentrated blackberry and plum on the nose and finished with medium tannins and oak. The hits just kept coming when we tried Mollydooker " Blue Eyed Boy " 2006 Shiraz. This Shiraz was awarded 96 points by Robert Parker and deserved it . On the nose this Shiraz had very concentrated hints of licorice, plum, raisin and raspberry. On the palate this wine was big, bold and bursting with spice, blueberry and espresso flavours with burnt oak. The finish is long and lingering with a nice texture and big tannins. Just when we thought the wines could not get any bigger we finished with Molleydooker's "Carninal of Love" 2006 Shiraz. This wine is also rated highly by Robert Parker at 97 points . It was made from some of Molleydookers best parcels of Shiraz. It is very dense and heavy in the glass. On the nose, powerful black currant, cinnamon and raspberry aromas hit you immediately. On the palate there is plum, raisins and finishes big with spice and long heavy tannins. Irene from Vegaswineaux stopped by and covered the event as well. This was a great opportunity to try some highly rated wines and enjoy lunch afterwards with a beautiful view. Thank you Vin Sauvage and Marche Bacchus for a great tasting. We had never been to Sonoma Cellars but have heard many great things about it. When Tex and Gidget invited us to join them we could not pass it up. We were also joined by Mike and Aaron as well . The first aspect I liked about Sonoma Cellars is the ability to bring our own wines in. We had four bottles that were brought in by our group. There were two from Chateaunef-du-pape, a LeVieux Donjon and Domaine Grand Veneir 2005. We also enjoyed a Tablas Creek Esprit de Beaucastel 2003 Paso Robles. As a special treat for the table we provided a Wagner Vineyard Cabernet Franc 2002 Finger Lakes. We got this wine when we attended the Finger Lakes Wine Festival in Watkins Glen this past summer. It is not often we can get Finger Lakes wines here in Las Vegas. If you want to know more about the Finger Lakes or Bill Wagner search the blog and you will find information about the area and its wines. We dine out often at many of the steakhouses here in Las Vegas. As a result , We felt we could compare the food and service of Sonoma Cellars with some of the best we have been to. First off, the service was fantastic. We never had to ask a second time for anything that was needed and were provided with a new appropriate wine glass each time we opened a new bottle. This was a nice touch considering we brought in bottles. Our server Rafael suggested we try the Rib Eye and the steakhouse salad. Being it is a steakhouse we agreed to his suggestion. The steakhouse salad is very large and full of fresh vegetables topped with a terrific vinaigrette dressing. The salad is so large it can easily be shared. The Rib Eye was cooked correctly per our request and served at the correct temperature. Sonoma Cellars is located inside the Sunset Station Hotel and Casino. Most of the steakhouses we have eaten at have been owned or run by renowned Chefs. We were a little skeptical on how Sonoma Cellars, as Casino Run restaurant would compare. The atmosphere, even though nice was not comparable to a Emeril's Delmonicos for example. The service was professional, personable and attentive to our needs. The food was better than I expected from a casino run restaurant. Overall, it was a good experience and would and eat there again.